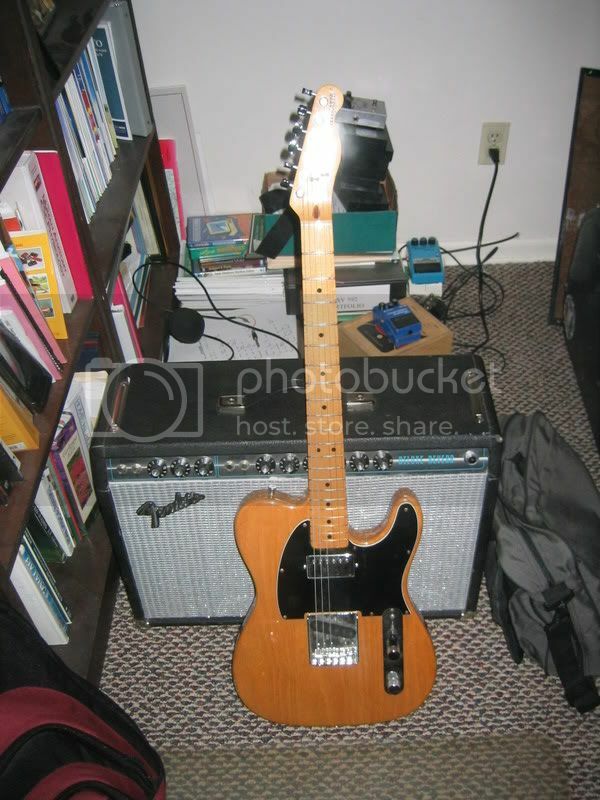 Need help with my 79 tele! Discussion in 'Guitars in General' started by squeally dan, Feb 29, 2008. I bought a telecaster about 14 years ago because I picked it up at the store and loved it. It was my main axe for many years but not anymore. I was told it was an 89 model and I got it for $800, but a few months ago I looked up the serial number & it turned out to be a 79 model. When I first got it I did some changing. I probably wouldn't have if I had known it was a 79. THe pickups were microphonic and so I had them changed. I needed more beef in the neck for solos, so my tech suggested reaplcing the neck single coil with a some type of Gibson humbucker. Also, the 3 saddle bridge was replaced with one that would intonate better. Recently I have had problems getting it set up correctly and it just doesn't sound very "alive" Seems like I keep running in to dead spots. Do I need new frets? Also, the hunbucker sounds real muddy. Should I go back to 2 single coils? If so, what would you guys recommend. The one in the bridge right now is some type of SD pickup but I have no way to know the model. Also, would another bridge wake this guitar up some? Help! I'd find someone who could set it up properly before jumping to any conclusions about the frets, or the neck pickup. I took it to a tech a couple months ago and he set it up, but its still fretting out higher up the neck. ANd it just doesn't sound as great as I remembered. Its my only tele right now and I want to get it back up to speed. I don't know if anyone can really tell whether or not it needs new frets, just from what you're saying. I'm a little worried about this last guy who set it up for you not being very good at what he's doing. Because, it shouldn't be fretting out higher up the neck. It played ok when he first set up, however, the action was a little lower than I would prefer. Seems as time went on it got where it would fret out higher up the neck. The frets look ok near the top of the neck, but I can't see them clearly below the 12th fret. I gotta agree with the guys on TDPRI. You need to get a better guitar tech to evaluate this. Someone with some luthier credentials. Its hard to find a good guitar tech around these parts. I am wondering if a different bridge, pickups, etc. might kick some life in to it. Sounds dead right now. I noticed I have the humbucker real low. Would raising it up maybe make it less cloudy sounding?